The Global Volcanism Program has no activity reports for Floreana. The Global Volcanism Program has no Weekly Reports available for Floreana. The Global Volcanism Program has no Bulletin Reports available for Floreana. The low shield volcano of Floreana Island, also known as Charles Island or Santa María Island, is densely covered with cinder cones. A 5-km-wide caldera at the center of the island has an irregular floor. Several young lava flows were considered to have been as young as few thousand or even a few centuries old based on their youthful morphology (McBirney and Williams, 1969), but a surface exposure age of 26 +/- 7 ka was obtained on the youngest flow (Kurz and Geist, 1999). An 1813 eruption attributed to Floreana in the Catalog of Active Volcanoes of the World is considered to have actually occurred at Sierra Negra volcano on Isabela Island (Simkin 1980, pers. comm.). 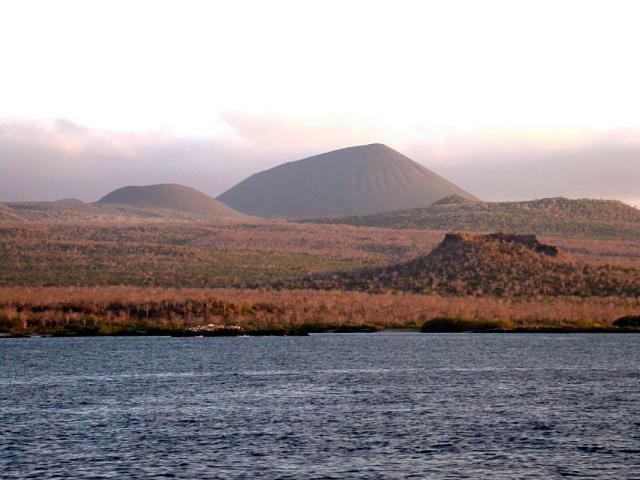 The most conspicuous of the cinder cones on the island is Cerro de Pajas, which rises 335 m above its surroundings. It fed a massive pahoehoe lava flow, perhaps the youngest on Floreana, that reached the SW coast over a broad 6.5 km area. Kurz M D, Geist D, 1999. Dynamics of the Galapagos hotspot from helium isotope geochemistry. Geochim Cosmochim Acta, 63: 4139-4156. Simkin T, 1984. Geology of Galapagos Islands. In: Perry R (ed) Galapagos, Oxford: Pergamon, p 15-41. Simkin T, 1980. (pers. comm.). White W M, McBirney A R, Duncan R A, 1993. Petrology and geochemistry of the Galapagos Islands: Portrait of a pathological mantle plume. J. Geophys. Res, 98: 19,533-19,563. The Global Volcanism Program is not aware of any Holocene eruptions from Floreana. If this volcano has had large eruptions (VEI >= 4) prior to 10,000 years ago, information might be found on the Floreana page in the LaMEVE (Large Magnitude Explosive Volcanic Eruptions) database, a part of the Volcano Global Risk Identification and Analysis Project (VOGRIPA). There is no Deformation History data available for Floreana. There is no Emissions History data available for Floreana. The Global Volcanism Program has no photographs available for Floreana. There are no samples for Floreana in the Smithsonian's NMNH Department of Mineral Sciences Rock and Ore collection. Large Eruptions of Floreana Information about large Quaternary eruptions (VEI >= 4) is cataloged in the Large Magnitude Explosive Volcanic Eruptions (LaMEVE) database of the Volcano Global Risk Identification and Analysis Project (VOGRIPA).